When Do You Need The Professionals? Just like the other areas of your home, your appliances and machines need some maintenance. It may not be every week or month, but they will eventually need a professional Charlotte AC repair crew to come in and take a look at them – at least if you want to continue to live comfortable with low energy bills. Hopefully that last bit caught your attention. A central heating and air unit that is left on its own for more than year can start to become overworked. These are specially-built appliances that filter your air and cool it down or heat it up – after a while, they’re going to need some maintenance and cleaning. That’s why Charlotte AC repair companies are so important to today’s homes. Everybody wants to have low energy bills, but if you don’t maintain your home’s unit, you could be causing it to overwork itself on hot or cold days. Overworking your unit is as simple as not having it maintained and forcing it to work just as it normally would. It will struggle with clogged up vents and filters, which means your costs will go up because it’s using twice as much electricity just to meet your expectations. 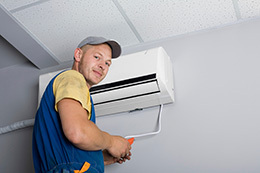 If you want your AC unit to run efficiently, you can’t skip out on hiring an AC repair company in Charlotte to come out and look at it at least once a year. One maintenance appointment form time to time can ease your nerves and make you confident that it won’t break down when you need it most.